Launching at the precise moment to satisfy orbital mechanics, a Russian resupply ship took just four orbits from liftoff to docking Saturday for a linkup on autopilot with the International Space Station. The sprint began at 2045:08 GMT (4:45:08 p.m. EDT) from the Baikonur Cosmodrome in Kazakhstan, as the three-stage, unmanned Soyuz booster rocket lit its engines and roared away from the Central Asian steppes. The single-day trek for docking was enabled by launching the cargo craft into a narrow corridor to catch the orbiting outpost. The space station flew directly over Baikonur four minutes before launch at an altitude of 259 miles. It was the first launch from Baikonur since the disastrous Proton rocket malfunction July 2, which went out of control and crashed into the ground next to the pad. The Soyuz appeared to perform nominally Saturday, successfully achieving orbit in 9 minutes and releasing the Progress M-20M freighter to start the six-hour pursuit of the station. The power-generating solar panels unfolded and the assortment of communications and navigational antennas deployed as commanded. The last Progress in April experienced a stuck antenna. A series of precise engine firings, compacted into just a few hours instead spread out over two days, guided the Progress toward an automated rendezvous with the station. 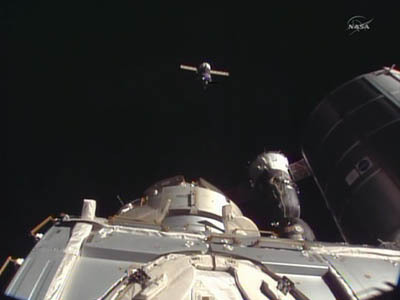 After performing a flyaround to align with the docking port, the craft commenced the final approach the close the remaining distance for a successful contact and capture at 10:26 p.m. EDT (0226 GMT), shortly after an orbital sunset over the South Pacific. The 24-foot long ship attached itself to the open port on the Pirs compartment on the underside of the station, which became available Thursday when the previous Progress flew away to fly solo for deorbiting into the ocean. Saturday's launch was known in the station's assembly matrix as Progress mission 52P and was the 51st to dock with the outpost since 2000. The craft ferried nearly three tons of supplies to the station. The "dry" cargo tucked aboard the Progress amounts to 3,395 pounds in the form of food, spare parts, life support gear and experiment hardware. Items for troubleshooting the spacewalking spacesuit that sprung a mysterious water leak during the recent EVA was shipped from Houston to Baikonur for this launch. The refueling module carries 1,212 pounds of propellant for transfer into the Russian segment of the complex to feed the station's maneuvering thrusters. The vessel also has 926 pounds of water and 104 pounds of oxygen and air. The space station is staffed by the Expedition 36 crew of commander Pavel Vinogradov, cosmonauts Alexander Misurkin and Fyodor Yurchikhin, NASA astronauts Chris Cassidy and Karen Nyberg, and European Space Agency flight engineer Luca Parmitano. The cosmonauts were ready to take over manual control of the approaching Progress spacecraft if the autopilot experienced a problem, but the ship docked in automatic mode without incident. Hatch opening between the station and Progress is planned for Sunday.